I have 2 Mersman end tables that need to be refinished. What would be the value if I would sell them as is? I would say $25 each. I have never seen any in person as they must not have been common in my area, but I have read about these and I believe they are a more rare and valuable Mersman--called a Hepplewhite Style. I encourage you to take them or really good pictures to a reputable antique dealer and get their worth from them. I have a feeling if they are what I think they are, they could be much more valuable than what you would get at a yard sale or flea market. Not to say these will make you a millionaire, that is not what I mean, but some of this style tables in certain markets can fetch up to $1000 a pair but that would be in pristine condition which yours aren't. Yes, condition brings down prices...so a dealer can tell you what they would be worth as is AND in the area where you are. Please post back what you learn and their value!!! They are neat pieces!! Maybe some day I will get to see one in person!! Before putting a price on to sell them, I would first do a little research. Google is a good place to find out any thing about your tables , put a description in and if you can find any manufacture marks or numbers that would help. Also try eBay and see if there are any tables for sale like yours. Even Craigslist is a place to check !! 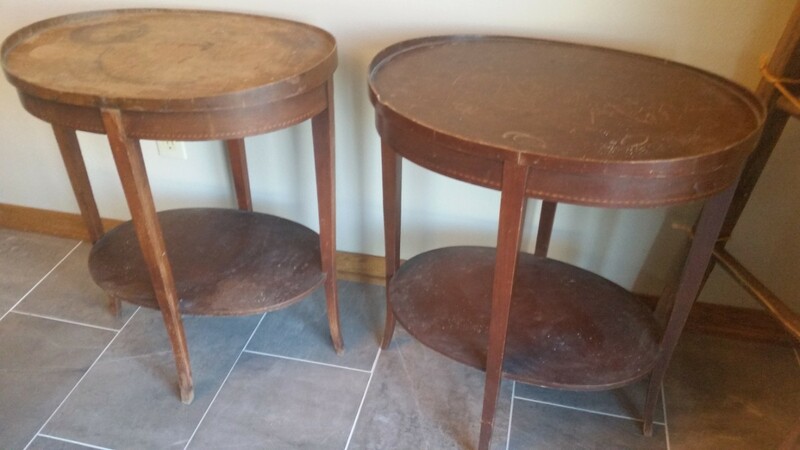 Original condition is often the best selling statement but seeing the condition of your tables, I feel pretty sure it would take a professional restorer to bring the value back to your table. It is true that Hepplewhite style tables are popular but you very rarely see any listed in this condition and even if they are redone by a professional they still may not bring the price of the original finish tables. But; there are exceptions such as this set (similar to yours) that sold in 2016. 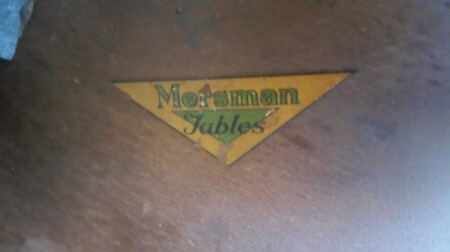 I think you will have to do some research to determine if you wish to refurbish your tables. Some people are even going the "shabby chic" style when having to restore tables like yours. If you Google - Mersman Hepplewhite end tables - you will find lots of sites to check for similar tables. Some will be a dead end (sold years ago or sites that will not tell you the selling price) but there will be some that you might gather information from. You can also check eBay and Etsy with the same wording and find lots of tables for sale - maybe even some similar ones.